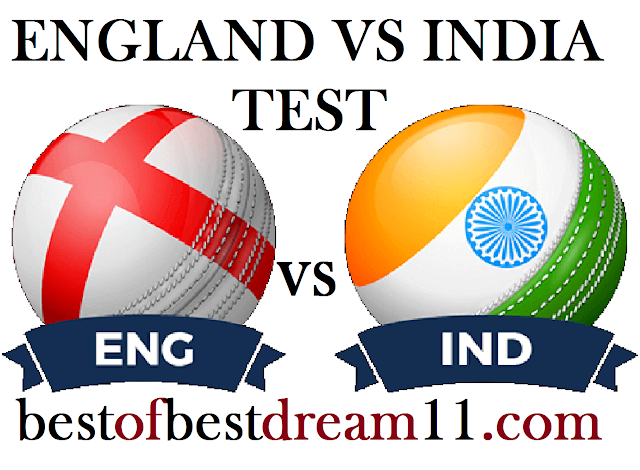 Here is best "ENGLAND VS INDIA" Third Test match, DREAM11 Predictions for the Fantasy user ,who venue are looking to make a strong team for maximum win. We are providing latest news, match update, information about the match .The team is picked by using various factors on the basis of performance, ground stats and latest form. By winning the first two matches of the five-match series ,England have taken 2-0 lead on India. In such a situation,this match becomes very important for India,because India will lose the series if it loses it. Virat's army will have to get into this match with full strength. This pitch will help the fast bowlers in the beginning but gradually they will also be able to help the batsman too. For India, its captain Virat Kohli has struggled alone on the England tour so far.He has scored 240 runs in four innings of two test matches so far ,including a hundred in the first test. The performance of Murli Vijay(26runs),A Rahane(52runs) and H Pandya(90runs) in the last four innings has not been special. in bowling ,R Ashwin(7wkt) ,Ishant Sharma(7wkt) and M Shami(6wkt) have performed well. For England ,its wicketkeeper Johny Bairstow has been the most successful batsman ever.He has palyed 191 runs in 3 innings so far. Joe Root(113runs) and K Jennings(61runs)also played good innings in the last 2 test matches. Chris Woakes performance was spectacular in the previous match,he also took 4 wicket in addition to making 157 runs. in bowling,J Anderson(13wkt) and Stuart Broad(7wkt) have bowled very well in this series. For England, Ben Stokes has returned to the team due to which Sam Currun has to be out of the team. For India,Jaspreet Bumrah is now fit and he is expected to play. wicketkeeper Rishabh Pant can debut in test cricket.